Here's a really budget break from a low-end favorite... Score! When Panini re-released Score in 2010, it came as a sweet blast from the past. By 2012, Score was still chugging along but the hype around it had slowed. It'll be fun to check out this blaster of Score and see what Panini did with that brand that year. It's not a product I bought heavily of when it came out. The price of this blaster definitely fits the content of it. As a low end brand, five bucks is about what I would want to pay. I don't expect much out of Score, certainly no hits... but it will be fun to pull some inserts and season highlight cards. The season highlight cards in the set are nice because they specifically point out notable parts of the season. It's fun to remember those special moments on cardboard. I definitely remember what the initial Panini Score product looked like, but I have actually forgotten what these cards look like. I'm pretty sure they will look like a typical 90's-ish Score product. 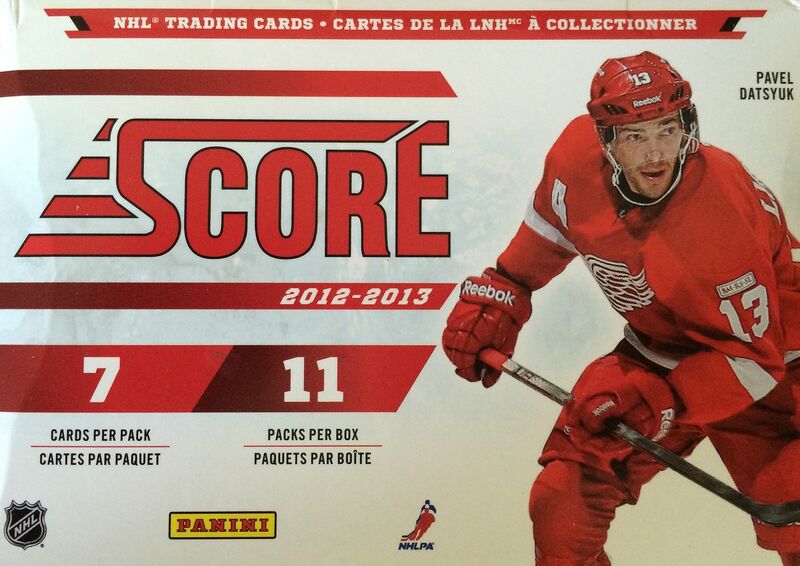 Like I mentioned before, since Panini's first Score offering, the product hasn't really stood out for me. It would have been nice for Panini to keep innovating the product, but instead they kept it pretty status quo. This blaster didn't really give out a lot of excitement. The rookies and inserts were alright, but nothing stood out to me. In fact, it was tough to find a top three this week because I felt like there just wasn't much of a selection to choose from. Even my base cards left me with very few stars! I guess one highlight for me was remembering what these cards actually looked like. These cards definitely do have that 90's look to them, and would fit into that decade very well. The gold cards that come one-per-pack could have been better designed I think. The fade-to-white look doesn't work for me - a solid gold border would have been much nicer. 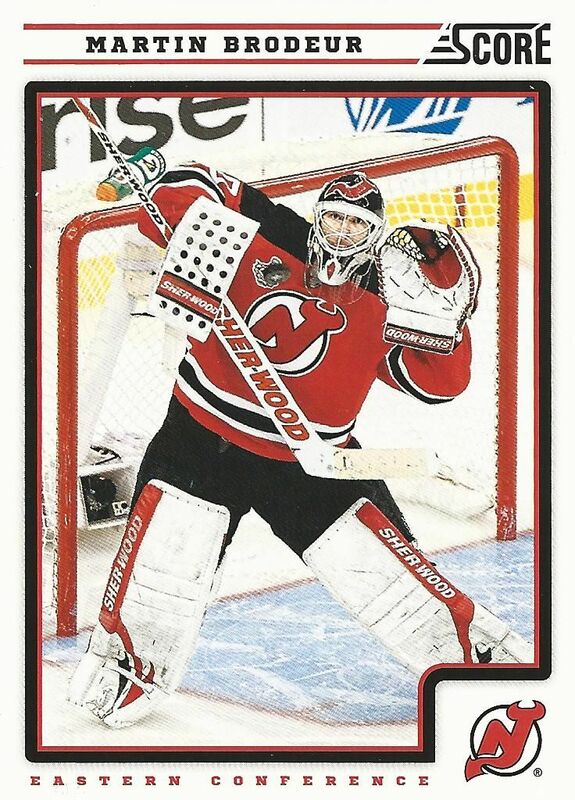 I've been pulling a lot of Brodeur out of packs recently. He recently retired as a St. Louis Blues player, but his best days were as a New Jersey Devil. It was cool to get this base card of him in what I'm used to seeing him as - a Devil! This is probably my favorite design of all the cards I pulled. I'm always a big fan of clean white-themed cards. 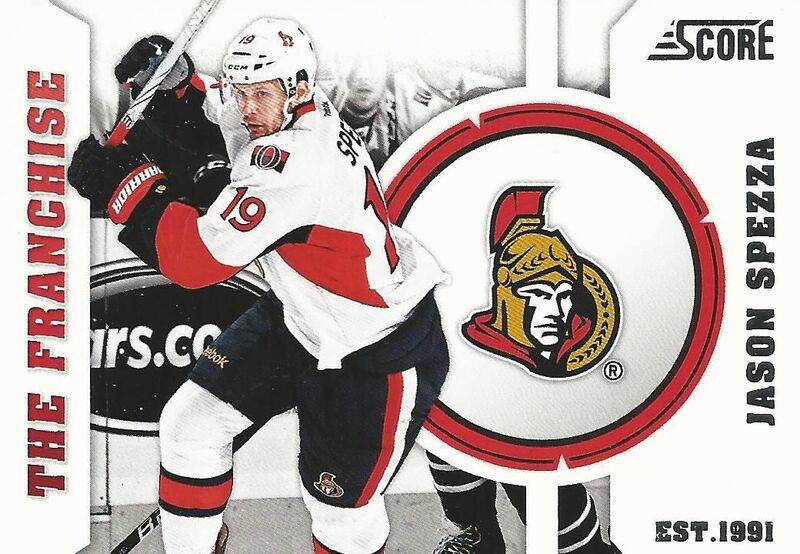 The Franchise inserts used to be very nice pulls out of packs. In this new era of Score, they are easy and not worth much at all - but I like them still. 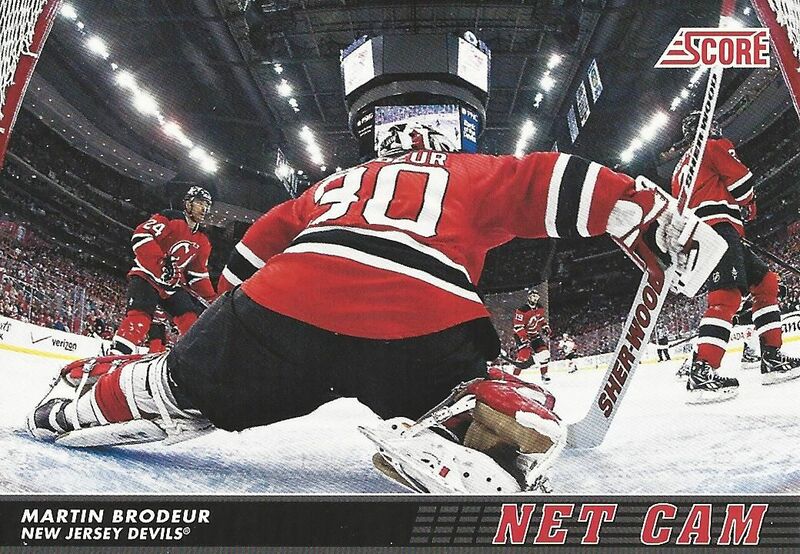 It was cool to get both the Brodeur base card and this Net Cam insert of him. Like I said, he's following me! These net view cards are pretty sweet and offer a unique look to the game. I really didn't get too much in this blaster beside a couple of Brodeur cards, but that's ok, I didn't pay a whole lot for it either. For the price, I'd just grab a few to open and test my luck, but otherwise I'd probably stay clear of these blasters. They would be a fun product for very novice collectors though. You'll find a ton of different players and inserts that give out fun information about the game's players.